A grey color variant of the upcoming Samsung Galaxy Sport watch recently leaked revealing the watch in its full glory. Now the upcoming Samsung Galaxy Sport watch has been leaked again in three new colors. Folks at mobiflip.de has shared fresh Press Renders of the upcoming Galaxy Sport watch in three new color options, including a blue, black and rose gold color. 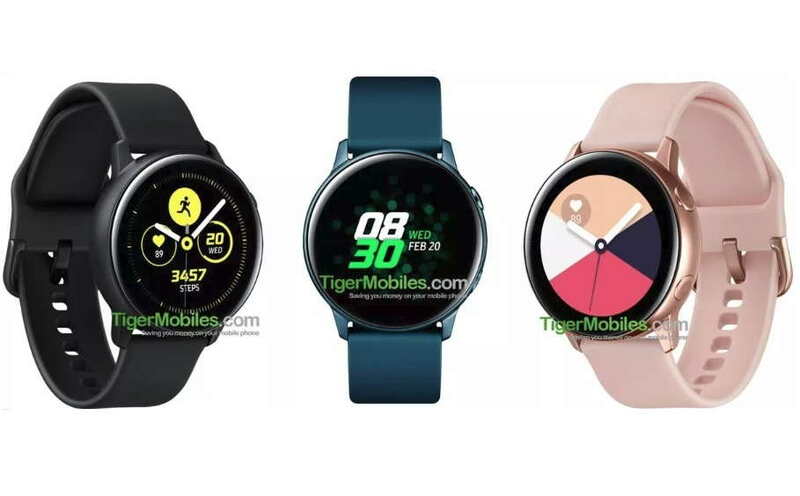 The fresh renders of the Galaxy Sport Watch don’t reveal much about it, but it does reveal that the upcoming Galaxy Sport Watch will have a new look and feel. The new image reveals a much-refined version of the 2017’s original Gear Sport watch. The new Galaxy Sport has a much cleaner design with more recessed buttons and a rounded metal body. Earlier rumor has suggested that the upcoming Samsung Galaxy Sport watch will feature a 4GB of RAM, Wi-Fi, Bixby Reminders, Bluetooth and NFC, for making online payments. Back in December last year, two new Galaxy Sport watch with model numbers SM-R500 and SM-R500X were certified by EEC. Notably, a number of other Samsung Smartwatches with model numbers SM-R370, SM-R370X, SM-R375, SM-R375X were also certified by EEC but we don’t have any official confirmation on theses model as yet. There are also no details on the new watches launch date, price, and availability.